I saw a post about Tinker Bell this morning and my own bell rung. Imagine Charlie Brown talking to Lucy about phobias. “THAT’S IT!” I love it when I have moments like that. I posted the image and returned to comment, and that’s what led me to this post. Yep…animated fantasy movie characters get my mind going. Whenever I’m in a bad mood, when I’m feeling a bit grumpy and reactive, a little attention goes a long way. You may not need to change anything, fix anything, teach anything; just give me a little attention. “I know your mad.”, “What’s wrong?”, or even “You’re beautiful.”, will generally fix things with me. It gives me the power to resolve the situation myself. My sons are great at this. When they are doing big things, things teens have to do if they are going to move out into the world as adults, I get scared and sometimes I feel neglected. They sit and hug me, ask me about my fears and objections. They listen. And then they go do what they were going to do anyway. They do take into account my feelings, but I know that ultimately, they will do what they believe is best for them. Personally, I think it is the hardest stage of parenting so far. One of my friends said she didn’t like Tink, that she thought she was a “jerk.” This was my initial response. All behavior is a symptom of someone’s feelings. We can’t help the way we feel about things. I’m having a hard time explaining this. I keep writing out the words and backing up. Let me start again. Behavior is what we do when we feel something. It’s a trained action that starts in childhood. I feel cold and I grab a blanket. It might be someone else’s blanket. You might say, “Hey, that person is a jerk. They stole my blanket!” or you could think, “Why did that person steal my blanket?” That question might lead you to understand that the person was cold and needed to be warm. The only thing they have learned to do is take the first blanket they see. Now, you’re probably thinking, “This woman is nuts. We can’t condone stealing because someone needs something. That’s anarchy!” I’m not condoning anything. I don’t need to think it’s ok for her to take my blanket because she’s cold, but I can understand and not be angry at that person. I can also lovingly ask why she took it and show compassion so she learns better behavior. There are very few people in this world that deliberately do things just to be mean. Almost everyone wants to be socially accepted and loved. And you go off to buy her one of her own, help her find one from a charity, or buy one as a gift because you can and you love the person she is. You know what she learns? Her needs are important and so are other people’s. 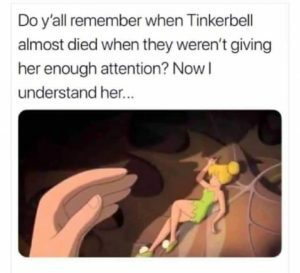 So, what does this have to do with Tinker Bell being a jerk? Tinker Bell is “acting out” as they say. She’s exhibiting nasty behaviors to get what she wants because she has learned no other way. She craves Peter’s attention and now he’s giving it to that damn Wendy. She’s jealous and rightly so, since Wendy wants Peter to leave Neverland and grow up. There are lots of Tinker Bell’s in our life. Our children, our parents, our friends, our lovers, they all exhibit behavior we are not fond of. My children throw a temper tantrum over not being able to finish a movie before bed. My mother texts me a thousand times about where I’ve been. My friend doesn’t call me back because I forget her birthday. My lover is slamming doors and sulking. They are all symptoms of feelings and needs. What if we decided to look around the behavior and seek out what those needs are instead of punishing the behavior? If we knew what the need was, maybe it’d be easier to understand the behavior and help that loved one find a better way of getting their needs met. Poor Tink. We see her as beautiful and filled with light. She can fly and make others fly, too! What more could you ask for? But really, she’s like all of us. She’s small and vulnerable and doesn’t know her own power. Peter could help her see that if he weren’t a child himself. Wendy does catch a glimpse of it but maybe she’s just too wrapped up in herself at the moment to help. There’s so much more. I’d like to read the book again and focus on Tinker Bell’s point of view.